ATLANTA, GA – To help celebrate their 10-year partnership with CampSunshine at Sebago Lake, Tropical Smoothie Café announced the launch of “Share The Sunshine” campaign to identify and send deserving families to the upstate-Maine camp that offers a fun experience to children with life-threatening illnesses. Camp Sunshine is the only program in the nation offered year-round with the distinction of having been designed to serve the entire family in a retreat model. The program includes on-site medical and psychosocial support. To make a nomination and help Tropical Smoothie Café share the sunshine, fans can simply go online to www.TropicalSmoothieCafe.com/ShareTheSunshine to submit a family’s name and share a story of why they could benefit from a Camp Sunshine Trip. Tropical Smoothie Café will select at least ten families from the submitted nominations to attend the camp. Selected families will be notified following the completion of National Flip Flop Day, which takes place on Friday, June 17th. 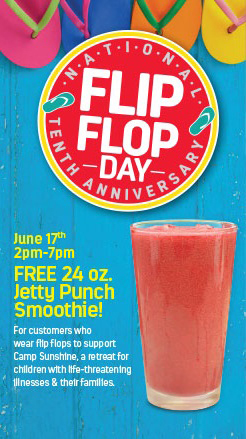 National Flip Flop Day has become an annual tradition in the Tropical Smoothie Café system where Jetty Punch, a strawberry banana smoothie, is given away to everyone who walks through the cafe doors in flip flops from 2p – 7p. All the brand asks is that guests make a donation to the Camp Sunshine effort. Last year the brand raised $1 Million and looks forward to another successful year on its tenth anniversary. Founded in 1997, Tropical Smoothie Café is a fast-casual restaurant concept inspiring healthy lifestyles across the country, with over 484 locations nationwide. With snack and meal options for any time of day, Tropical Smoothie Café serves smoothies, salads, tacos, wraps, sandwiches, and flatbreads. The rapidly growing franchise has received numerous accolades including being ranked on Entrepreneur's2015 Franchise 500, 2015Fast Casual Top 100 Movers and Shakers and Nation's Restaurant News' 2015 Top 200.Tropical Smoothie Café is seeking qualified franchisees to expand throughout the United States in markets such as Atlanta, Houston, Dallas, Charlotte, Philadelphia and Columbus, Ohio, among others. For more information, visit www.TropicalSmoothieFranchise.com. 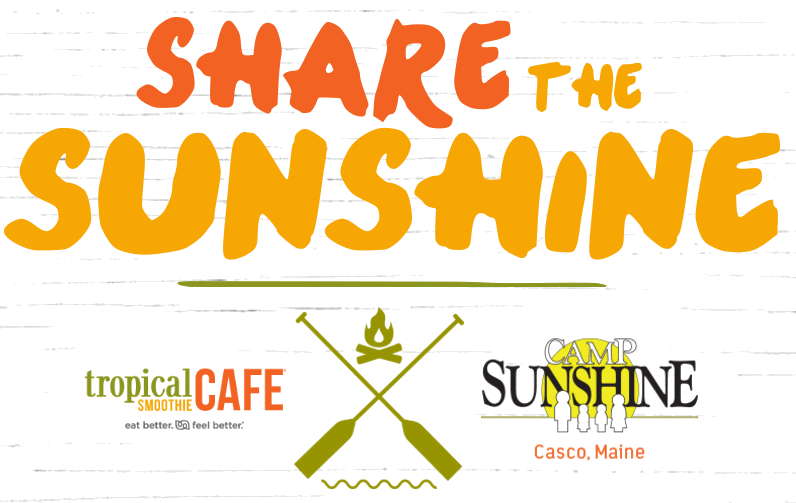 Camp Sunshine is a year-round retreat located in Casco, Maine, 30 miles from Portland on Sebago Lake. Since its inception, Camp Sunshine has offered comfort, hope, and support to over 43,500 individuals from 48 states and 23 countries. Camp Sunshine is currently the only full-time facility in the nation whose sole purpose is to provide respite for the whole family. The camp programs provide respite to children with life-threatening illnesses and their immediate families through various stages of the child’s illness. The program is free of charge to all families, and includes 24-hour onsite medical and psychosocial support. Bereavement groups are also offered for families who have lost a child to an illness. 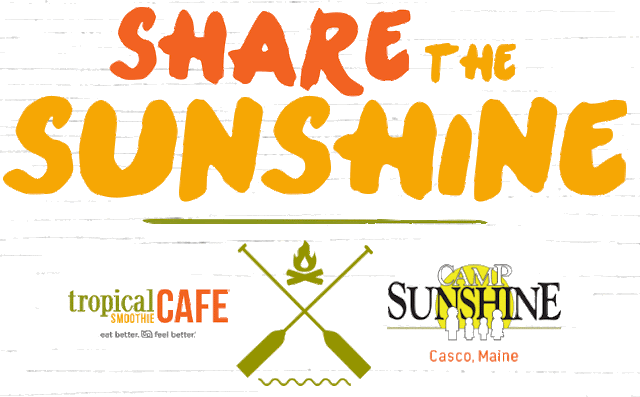 For more information, visit the website at www.CampSunshine.org or call (207) 655-3800.